This question comes up A LOT. Can a provisionally licensed person bill under a supervisors’ license. Is that fraud or is it okay? The answer is maybe. Context matters in this situation. Here are some things you need to consider to determine if you might be eligible to do this type of billing. First, let’s make sure we have common language as we discuss this topic. The process of one clinician providing services (usually the resident or provisionally licensed clinician) and billing under the supervisors credentials is called “incident-to” billing in the Medicare world. Additionally, the part of incident-to services and billing that comes up most frequently for mental health professionals is when services are supervised by certain non-physician practitioners. The services must be part of your patient’s normal course of treatment, during which a provider personally performed an initial service and remains actively involved in the course of treatment. Note: The provider does not have to be physically present in the patient’s room while the services are performed but you must provide direct supervision. You must be present in the office to render assistance, if necessary. The patient record should document essential requirements for incident to service. You must be on site to render assistance if needed. If you are a solo practitioner you must be on site to supervise. If you are in a group and qualified provider can be present to supervise. 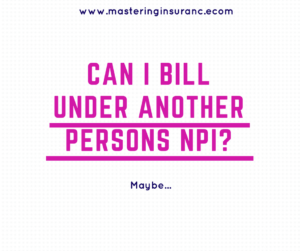 None physician practitioners can provide certain services in the place of physician practitioners (Medicare providers), and bill under the Medicare provider’s NPI number. The attending provider who orders the service and provides the treatment plan must see the patient first, but not on every occurrence/visit. There must be continued oversight and engagement by the attending provider in the course of the therapy, including documented review of the notes and brief direct contact with the patient to confirm findings and evaluate treatment. The services provided must be under the scope of practice of the rendering provider AND the supervision provider. A billing provider cannot hire and supervise a professional whose scope of practice is outside the provider’s own scope of practice as authorize under State law. For example, a Licensed Clinical Social Worker may not hire a Nurse Practitioner and bill for the NP’s medical services under the “incident to” provision, because a medical service by an NP is not integral to a social workers personal professional services, and is not regularly included in the SW’s bill, and is outside of the SW’s scope of service to provide medical services. Medicare routinely allows incident-to billing services. Most private or commercial plans do not. It is critical to determine if your site and credentials allow you to provide incident-to billing services. It is best to contact each individual panel to determine if incident-to billing or supervised services are allowed under the plan. Lastly, this billing practice is most common when M.D.s or D.O.’s are the supervising provider. Need help getting your team credentialed? The DIY Credentialing 101 e-course is LIVE! Register now class starts soon! Join our supportive facebook group Mastering Insurance for Mental Health professionals. Previous Previous post: 5 reasons your claims are being denied! Next Next post: Insurance is recouping funds. What are my options?